in the U.S.A. since 1985. Add your own logo and graphics for that professional touch! The Poly Band StandTM has created custom band stands for thousands of musicians, music educators, and entertainers worldwide for over 30 years. Superior strength to weight ratio. Each stand weighs less than 3 pounds. Folds up flat for quick toting and storing. Constructed from special plastic fluted material that is moisture proof and solvent resistant. Proven long life under normal usage. Attractive, Clean, Bright Colors That Make Your Band Stand Out! Clean bright colors, pleasing to the eye. Color will not crack, chip or peel off. Easily cleaned with soap and water. Available in White & Black. You may mix or match colors of base and top. Shelf wires and other accessories are sold seperately. 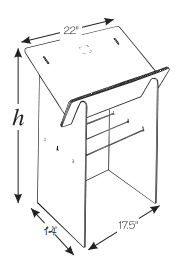 Standard stands are recommended for sit down playing. Height of stand measured at front of stand. The Poly Band StandTM by Embee Ideas is used by major musicians and bands around the world! The Count Basie Orchestra, Western Austrialia Youth Jazz Orchestra, and The Fabulous Jimmy Dorsey Orchestra are just a few bands you'll see with the Poly Band Stand TM by Embee Ideas. Just a quick letter to thank you and Embee Ideas for the superb PolyStands. Throughout the past six years, they have proved to be remarkably reliable, durable, and conveniently light-weight which of course makes them incredibly easy to transport. On average over the past six years, we have performed eighty dates per year. The stands have shown little or no sign of wear and look as good today as they did on our first performance. The stands are truly irreplaceable and our satisfaction has been 150%! Available in white and black. 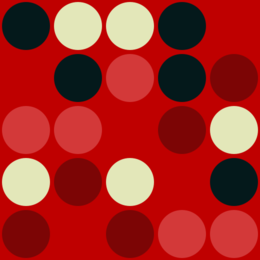 You may mix or match colors of base and top. Height of stand measured at front of stand. The 24” Standard Poly Band StandTM is great for seated playing since it allows more sound from the band to project into the room. 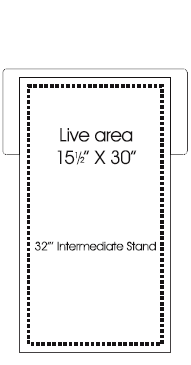 The Intermediate 32” Poly Band StandTM is good for sit down players that want a taller stand. 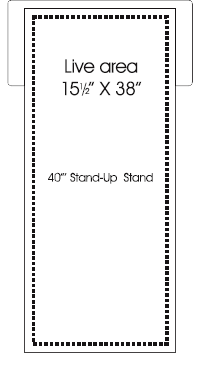 The 40” Stand-Up Poly Band StandTM is recommended for all players that stand, leaders, and vocalists. 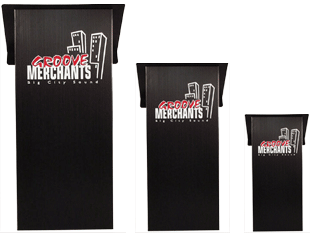 We can also customize The Poly Band StandTM to any height under 40” for an additional charge of $5.00 per stand. 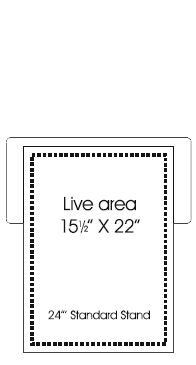 *Graphics are NOT included in the price of the stand. Please see graphics page for details. It is easy to add the Poly Band StandTM to your repertoire. Click the "how to order" button below to find out all the details you need to send so you can get your own Poly Band StandTM.